my mother died 10 october 2014 at age 96 1/2 years old . my father died 20 september 2015 at age 95 and 11 months years old. i was devoted to my parents. i feel their absence deep within me. i feel like i am disappearing........all of the people who knew me through my very happy childhood are gone......my parents, my beloved in-laws, grandparents, aunts, uncles, cousins, family friends. all of the people who have/had shared my childhood and enriched me with their love....who had/have the memories of me growing up......all who made up the fabric of my life......all are gone. yes, there are people who know me....my husband of 45 years....who i grew up with starting at age 5, my son who knows me from his childhood on, my beloved granddaughter, age 11, who knows me through the prism of her childhood.......but all others.........no longer here to have the memories of me. i share my myriad number of photographs of my life with my granddaughter so she will know me as i am....and as i was.....and tell her all the stories about me (and she loves to hear them! )........but the ones who were actually with me as i was growing up........are gone. this feeling is a reaction, i am sure, to the death of my mother a year ago and to the recent death of my father.........i imagine, i hope, that this feeling of disappearing will lessen over time. Your pain is evident in this wonderful image, Such a dramatic change from your usual bright colours however this works so well. Wishing you a peaceful weekend Jennifer. My deepest condolences! Outstanding work of art to express your feelings! Love the choice of black, white, and red! So sorry to hear of your losses, Jennifer. I understand how you feel but you will live on through your son and granddaughter and, of course, your lovely artwork. Wonderful selfportrait! ************* Your pain is in my heart - but nobody dissapears completely, they are living on in our person (body, soul, brain, our works)! To speak with them in inner speech can be helpfull! a beautiful tribute to your parents. Your artistic talent is certainly not disappearing. A powerful image, indeed. Yes... Sadness at your life........Your artistic talent is certainly not disappearing... They are with you forever in your heart. So sorry Jennifer! On the other side, you had your parents living with you for so long, that is a kind of blessing. I lost mine very young, sometimes I wonder how different it is for those who have lived beside them for many years. That was very touching Jennifer. Very touching image , dear Jennifer , and all your words! Been important for somebody - it's big value , this never "disappear" in heart.Our all experiences and feelings create us.. This is very beautiful remembrance, Jennifer! Hello Jennifer, I know exactly how you feel. It's lovely you've made this beautiful collage and you're sharing it with us. Thank you! love how the parents and grandparents look protecting the little girl ! Wonderful,my friend! wish you a happy weekend,Blessings to you:-)! Wonderful piece of art work, but very heavy comments. Well done. Have a nice week. Hola amiga, los fallecimientos siempre son muy difíciles de asimilar, te doy mis mas sinceras condolencias. Hermoso el homenaje que realizaste, con esa creatividad y originalidad que te caracteriza, saludos. This is terrific Jennifer! Subdued but very powerful! An artistic, beautiful and most of all a very thoughtful tribute. Kiam ni mortas ni malaperantas, forlasante la korpon...sed ni restas en &#265;iuj anguloj de tiuj lokoj kiuj ni vizitis, ni estas parto el ili, el la naturo, el la akvo, el la aero, ni mortas sed vivas en la memoro de &#265;iuj tiuj kiuj amis nin, en la ridetoj kaj larmoj, sed kiam neniu restis por memori&#285;i, ni estas ankora&#365; tie. Let disappearing, leaving the body ...but we are in every corner of those places we visited, we are part of them, nature, water, air, die and live in the memory of each of those who loved us, in the smiles and tears, but when no one left to remind us, we are still there. Congratulations, it's a beautiful message art, we are part of everything we see and what we see. Very touching and caring words.....that's life and we sometime can't understand why...You have done a wonderful artwork which will be here for ever....and someone will thinking of you creativity even if you gone. Beautifull and very emotive composition, our parents are parts of what we have been up to the end !! De nouveau admiré ici ..! Jennifer, you were lucky to get your parents a so long time. But of course, nothing can last here... and you know it. Now, tell your granddaughter about your beautiful and rich life. 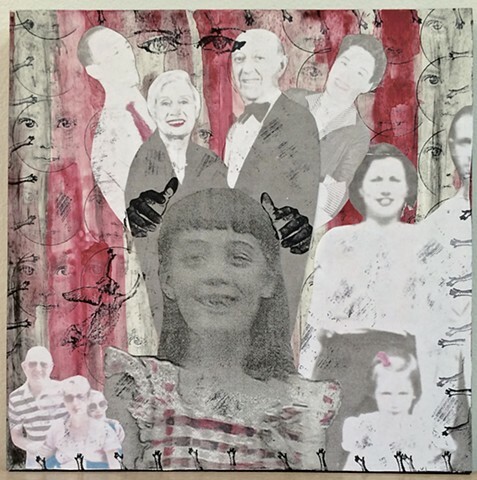 She sure won't forget you ...Your collage here is wonderful ! The colors are so harmonious ! *****All the best. Sorry for your loss. I understand how you feel and my thoughts are with you. I like this more and more . . . This is a very moving artwork. At first glance it looks happy and cheerful, but on closer inspection and having read your extensive notes it really expresses sadness and loss. I think this is something we all feel as we get older and lose friends and loved ones, but at least you can take some comfort from the knowledge that you will live on through your offspring and your unique works of art.